With something to impress everyone in your group, Branson Landing is a must-visit stop on your vacation itinerary. Whether you want to shop, dine or be entertained, you can find it at Branson Landing! Branson Landing is anchored on the north end by Belk department store and on the south end by Bass Pro Shops. As you stroll through Branson Landing, you will find classic women’s apparel stores such as Chico’s, Christopher & Banks and J. Jill, as well as stores featuring more trendy selections such as Francesca’s, Mark Ashton and Rue 21. For a mix of classic and trendy fashions, visit Maurices. For kids’ clothing, check out The Children’s Place or Justice. And don’t miss the newest clothing retailer at the Landing, H & M, known for its fast-fashion items at reasonable prices for men, women and kids of all ages. If you’re in the market for shoes, Branson Landing delivers. With retailers such as Famous Footwear, Rack Room Shoes, New Balance, Journeys and Tradehome Shoes, you will find the right style and fit for everyone on your list. 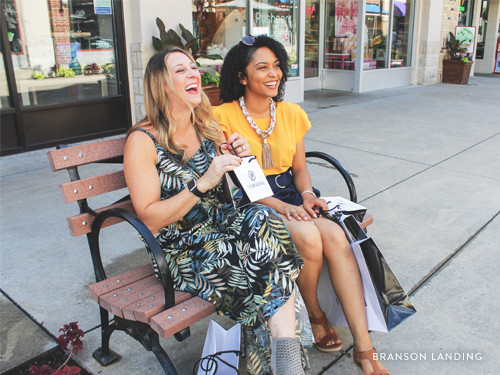 Branson Landing also has a great selection of stores featuring women’s jewelry and accessories such as Brighton Collectibles, Versona Accessories and Claire’s. You will also find a wide variety of specialty stores with wares for your home such as Kirkland’s, Kitchens, Yankee Candle and Seasons Home. For the sports enthusiasts on your list, check out Lids, On the Ball Sports or Cardinal’s Clubhouse. Visit Pepper Palace, The Spice & Tea Exchange or Nika’s Olive for unique specialty foods that make great gifts. And for perfect surprise for your pet, stop in Don’t 4 Get About Me. Branson Landing is full of great places to catch a tasty lunch or dinner. Many of the restaurants have outdoor patio seating either overlooking beautiful Lake Taneycomo or the spectacular fountains located in the town square in the heart of Branson Landing. Try Black Oak Grill for delicious American cuisine or Big Whiskey’s (great sports-watching spot! ), Garfield’s or Waxy O’Shea’s Irish Pub for a fun bar-and-grill atmosphere. For great steak, try Saltgrass Steakhouse. For seafood, head to Joe’s Crab Shack or White River Fish House, and for bar-b-que, try Famous Dave’s. Or if you’re in the mood for Mexican food in a sophisticated atmosphere, you don’t want to miss Cantina Laredo. New in 2019 to Branson Landing are two celebrity restaurants—Jimmy Buffet’s LandShark Bar & Grill and Paula Deen’s Family Kitchen—as well as a new pizza place, Mellow Mushroom, and Dude’s Daiquiris. For a quick bite to eat at Branson Landing, try Charley’s Philly Steaks for delicious hot sandwiches, Smith Creek Moonshine for gourmet burgers (and moonshine tasting! ), or Sweet Bay Coffee Co. for sandwiches, salads and wraps. If you thought Branson Landing was just shopping and eating, you’re in for a treat! Be sure to leave time for some fun for the entire family! Check out Arcade City, where in addition to games and prizes, you can experience the 7D Dark Ride Adventure and the Mirror Maize. 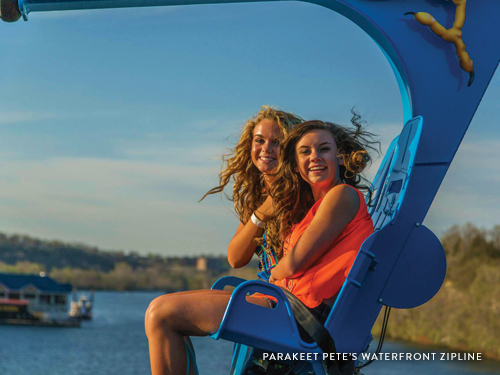 For an adrenaline rush, ride Parakeet Pete’s Waterfront Zipline, a zip-rider that soars over Lake Taneycomo. And for panoramic views of the area, ride the relaxing Parakeet Pete’s Steampunk Balloon. Or enjoy something truly unique at Branson Jet Boat, where during your scenic tour of Lake Taneycomo, you will also experience full 360 spinouts, power stops and slides. Warning – you will probably get wet! You can also experience the beauty of Lake Taneycomo on one of two sight-seeing cruises—Landing Princes Dinner Cruise or the Lake Queen Paddleboat Cruise—that leave out of the Main Street Marina. 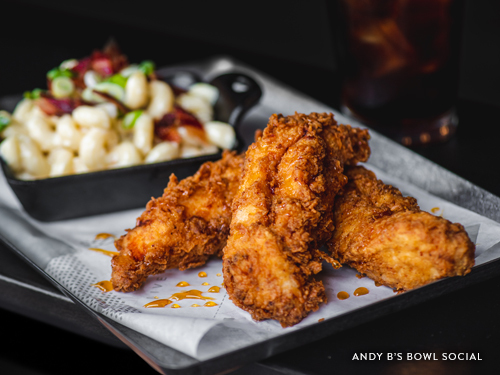 New in 2019 is Andy B’s Bowl Social, where you can enjoy delicious food and drinks, as well as bowling, escape rooms, karaoke rooms and classic table games. While you're there, don't forget to check out all the Historic Downtown Branson has to offer!